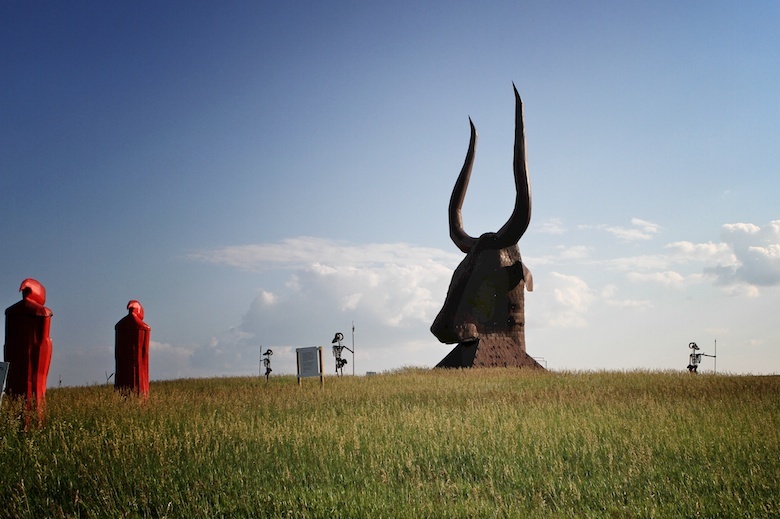 Located on the the South Dakota Drift Prairie, the Sculpture Park has at least 50 industrial art sculptures created by Wayne Porter with scrap metal, old farm equipment, or railroad tie plates. While in high school, Wayne began welding in his father’s blacksmith shop in St. Lawrence, South Dakota. After graduation from college, he moved back to St. Lawrence and worked in the blacksmith shop and raised livestock and welding on his sculptures in his spare time. 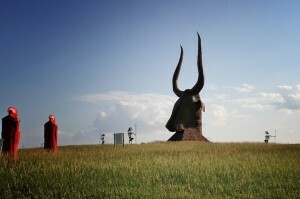 The sculptures started out very small and got bigger and bigger, with the largest sculpture in the park is a 60-foot-tall bull head. This highway head turner took three years to build, weighs 25 tons, and is the same size as the heads of Mt. Rushmore.